There exists today many democratic nations in and around the Indo-Pacific region, many of which strive for human rights and freedom. Yet still the region is plagued by human rights crises, with multiple ethnic and national minorities leading lives under oppression. In particular, expansionist endeavours by the People’s Republic of China in recent years has not only threatened the democracies in the region, but also caused untold misery to the Uyghurs, the Mongolians, and the Tibetans living within her borders. Religious practices are restricted, national languages are suppressed, and freedom in general for these ethnic minorities has been on an ever worsening decline. The situation for the Hong Kongers is no less depressing, with the One Country Two Systems promise effectively broken, the Pan-Democrats summarily oppressed, and the population effectively subject to systemic cleansing by means of forced immigration from China. As for Taiwan, her democratic rule by law is facing erosion from the hands of Chinese infiltrators, and the current peace across the Strait is quickly deteriorating with Chinese escalations in show of force. The “Indo-Pacific” Strategy proposed by such countries as India, Japan, the US, and Australia recently is exactly an answer to the aforementioned expansionist and authoritarian tactics of China, hell-bent on imposing herself as a colonial power on her neighbours. The Strategy’s aim is simple: to keep peace in the Indo-Pacific region, and to preserve and protect the freedom that many nations in the region enjoy. We at the Free Indo-Pacific Alliance believe that cooperation at the governmental and military level is not enough to achieve this goal. To this end, we the representatives of the Uyghurs, the Southern Mongolians (Inner Mongolians), the Tibetans, the Hong Kongers, the Taiwanese, the Japanese, and the Indians have come together to establish an alliance between the nations and the peoples of the Indo-Pacific. With united will, the Free Indo-Pacific Alliance Preparatory Committee is hereby established. To seek, preserve, and protect the freedom, human rights, and democracy of the Indo-Pacific nations via civilian initiative, lobbying, and any effective tactics. To those countries who house minority national and ethnic groups, the Free Indo-Pacific Alliance demands the appropriate respect for the minority group(s)’ religion, beliefs, national language, and freedom to protect and develop their national culture. 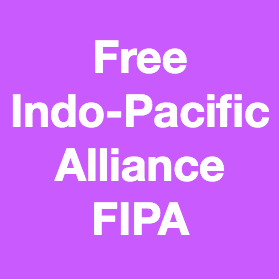 The Free Indo-Pacific Alliance Preparatory Committee shall commence the relevant lobbying and human rights activism henceforth, and call the Founding Meeting as the situation befits the time.